So to start of I'll talk about quality since you don't want to be spending your money on something that just isn't going to be that great. I currently own 2 palettes and a highlighter, I'll start with the palettes. Makeup Revolution have currently released lots of palettes ( I want to say hundreds but I'm sure that's just me getting excited). They have a big range of colours which to be honest makes it harder to pick. The colours are also very pigmented. I normally try and prime my eyelids to make the eyeshadow last longer however when I don't the colour still stays on all day. At the end of the day the colours only slight fade (and I mean really slightly). 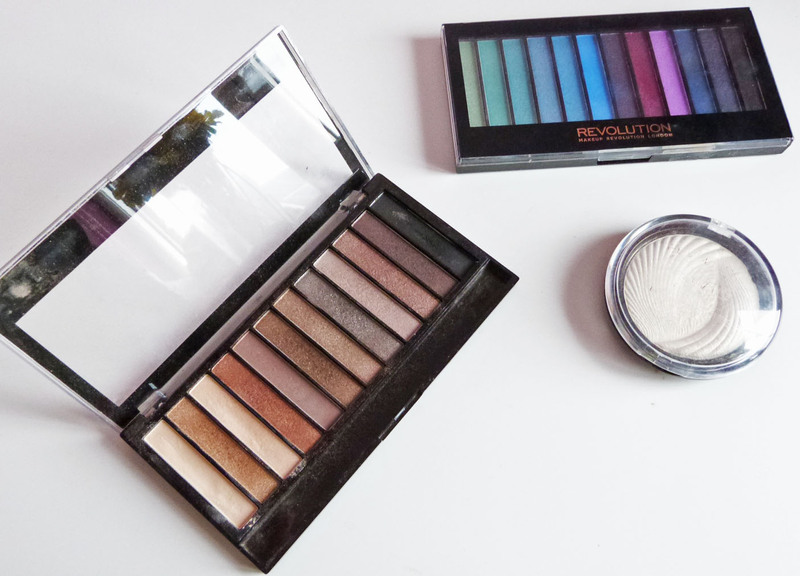 I use this palette for going out too (silver and black shades) and the colour stays on all night. Another thing is that its really buildable. For a stronger shade I sometimes wet the brush and apply the shade then which makes it slightly creamy but then you can build it up and finish off with a dry brush. The highlighter again is very pigmented! I meant you don't expect it so you just swirl your brush in it and apply and pow! So a tip, just use it with care. The colour is a really lovely shade and really brings attention to some areas like the cheeks. Moving on to prices. Here's the website for more products and prices. The reason why I started to buy Makeup Revolution products was because I always just saw it in Superdrug and due to me being cheap as hell I always went for that rather than Revlon for example (no hate, still love Revlon hehe). I always saw the lipsticks and powders for £1 and it doesn't get any better than that. Anyhow both of the palettes were £4 each. For the amount of shades that is an amazing price. Makeup Revolution have also been recently releasing similar palettes for £6 which include dupe of the Too Faced Chocolate Bar palette. I'd also recommend following them on instagram because you'll see the new products sooner (can I just say they've brought out a new range of brushes! I know! They're so adorable). Makeup Revolution has also made a lot of ready made gift sets for christmas so if anyone has started their Christmas shopping yet and they want a nice little set of lipsticks, why not head to Superdrug. Also I saw a makeup calendar! I want it so bad! I think I'm going to do a Christmas wishlist post, I just feel like it would be super fun to write about.